Night time has its own look and feel to it. The stars are lit, the moon is out, and shadows are cast in all different angles. It can be nice to get outside when it is dark outside to enjoy the stillness that comes with the night, or even to have an outdoor gathering full of fun and festivities. Lanterns and torches will greatly add to the ambience of the night. 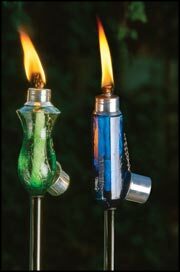 They will help to illuminate your garden, yard, porch or patio in the natural glow that only a flame can produce. Your garden will be transformed into a glowing campfire like setting when they are lit. Not only will the lantern add to the ambience at night, lanterns also make beautiful accent pieces in the yard or garden when not lit. Many granite lanterns will have an Asian look and feel to them, and they can be found in all shapes and sizes. Torches are perfect for when you want to set up a boarder line, to light up an area where a gathering will take place, or perhaps to illuminate a trail or pathway to an area in your yard or garden, or around a pool or spa. Torches are made out of different materials, such as bamboo tiki torches, while other torches are crafted out of materials such as aluminum, steel, and stone. Torches will usually burn on gas or oils and many can be adjusted for various levels of flame intensity.